Carbon capture and storage (CCS) is seen to play a major role in reducing carbon dioxide emissions. In recent years, many performance and cost studies of new coal- and gas-fired power plants have been conducted. However, the technology is either not yet commercially available or not economically reasonable for the large-scale coal-fired power plants that are built today. At the same time, many new coal-fired power plants of this kind are being built, which will emit large amounts of carbon dioxide in the future. China, for instance, is expected to increase the capacity of its coal-fired power plants by 485 GW from 2008 to 2035. Therefore, capture-ready power plants seem to be an attractive solution, enabling a later retrofit. The major parameter influencing the value of capture-readiness is the time of CCS-retrofitting and the discount rate applied to the future cash flows. In order to determine the optimal time of retrofitting, it is important to account for alternative technical options available for switching from conventional coal-fired power plants to coal-fired CCS power plants. Such options compete with the retrofit of a capture-ready power plant and might be preferred, further delaying the necessity of retrofits of CCS-ready power plants and reducing the option value of capture-readiness. A recent study investigates the value of capture-readiness by examining the merit order of various clean-coal pathways in terms of the cumulative probability of adoption. To do this, an enhanced net present value model with technology and path-dependent discounting is developed. The model endogenously determines the associated economic risk based on the combination of the underlying assets’ prices (i.e. price of electricity, fuel and carbon dioxide), which is a result from the technology-specific input and output quantities (electricity output, fuel consumption, carbon dioxide emissions) and the path-dependent prices. 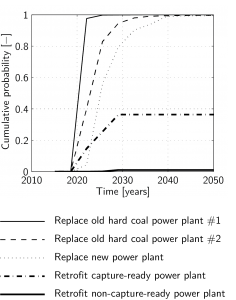 Applying the model and using technical specifications from the German “Pilot Study 2010” we find that the option of replacing older power plants including a premature shut-down with a new CCS power plant is, in the majority of investigated scenarios, the preferred choice (see figure). In addition, we show that the option of replacing a new conventional coal-fired power plant (built in 2015) with a new CCS power plant is also much more likely than retrofitting a non-capture-ready or even a capture-ready power plant. 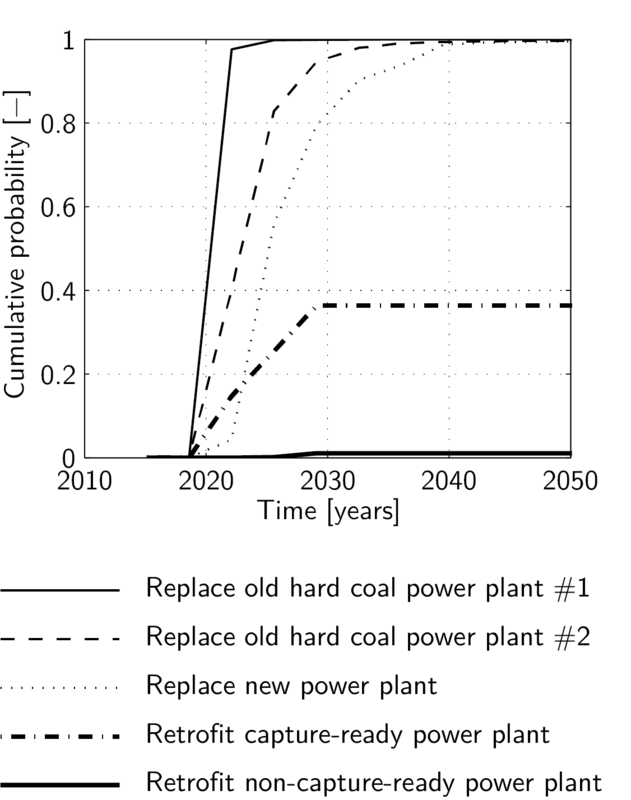 For the value of capture-readiness, we conclude that, although capture-readiness increases the chance of a retrofit strongly in comparison to a non-capture-ready power plant, the chances of conducting a retrofit are still low due to the additional option of a premature shut-down in combination with a new-build CCS power plant. Expenditures for capture-readiness should therefore be well-deliberated.